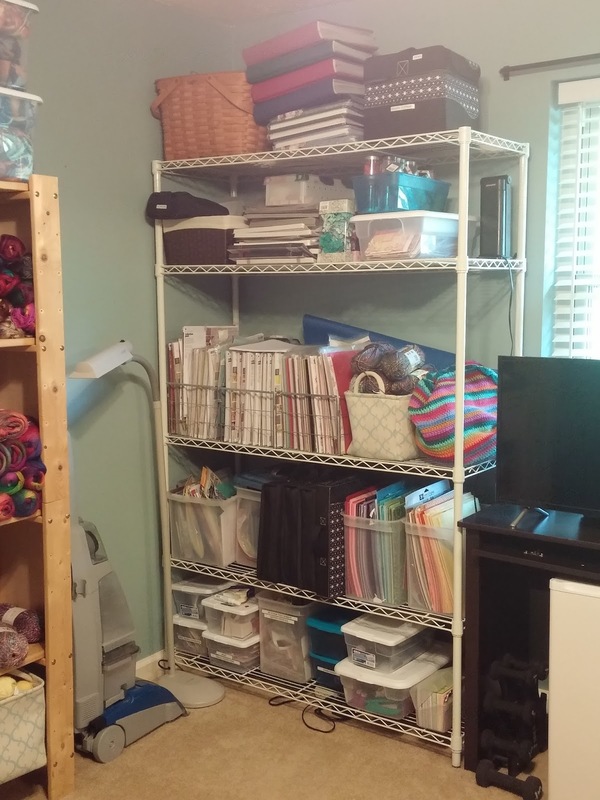 My craft room is my most favorite room in my home because it is full of all of my yarny goodness! 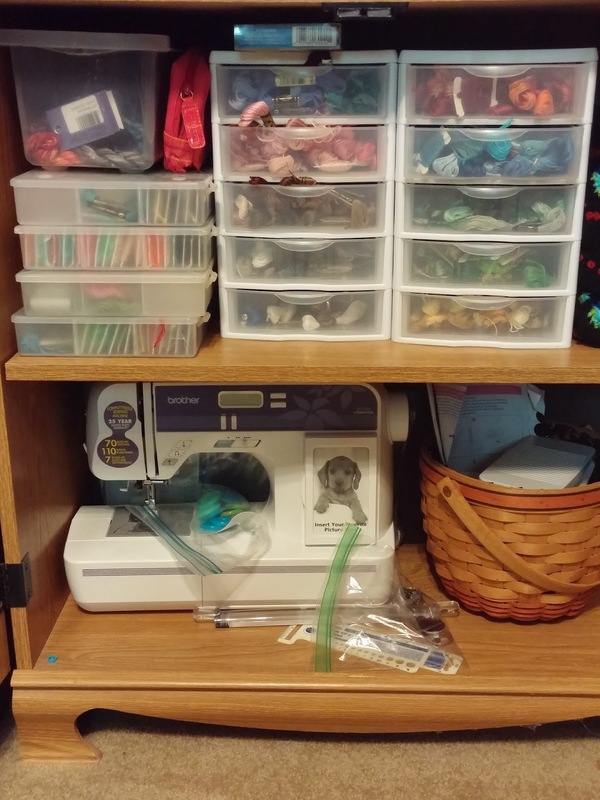 It also holds my scrapbooking and paper crafting supplies as well as some other items. This is what you see when standing in the hallway looking into the craft room. This is the first shelf on the left side. It holds various yarns - James C Brett Chunky, Stylecraft Aran and Chunky, Papatya yarns by Hobfy.com, Lion Brand Color Waves, Scheepjes Invicta Colour, Stylecraft Cabaret, King Cole Riot, King Cole Drifter, Stylecraft Tweedy, Scheepjes Sunkissed, Secret Garden and Stone Washed. This shelf is full of my Creative Memories supplies with some finished scrapbooks on the top shelf. 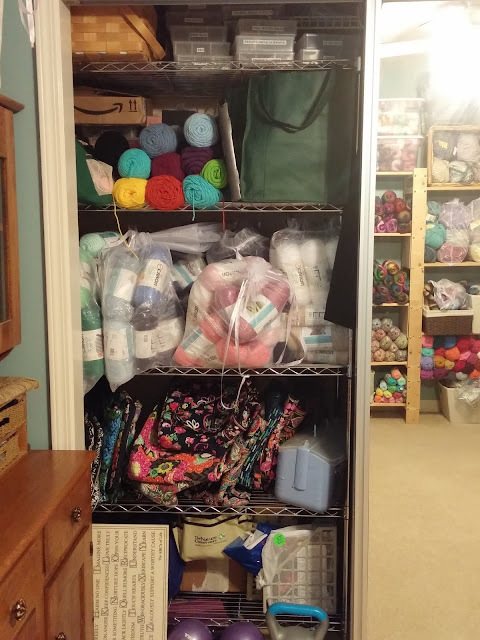 There are also 2 containers of yarn here as well ... I know some of it is sale yarn from Hobby Lobby. The fridge under the desk holds all of my essential oils. Refrigerating them doubles their usage time. When my oils "expire," I use them in cleaning items or keep using them in the diffuser knowing that their therapeutic properties are not there anymore. It doesn't mean they still don't smell good! The cupboard houses more aromatherapy supplies. Of course, there is yarn in the baskets! The organza bags are holding yarn for future projects. 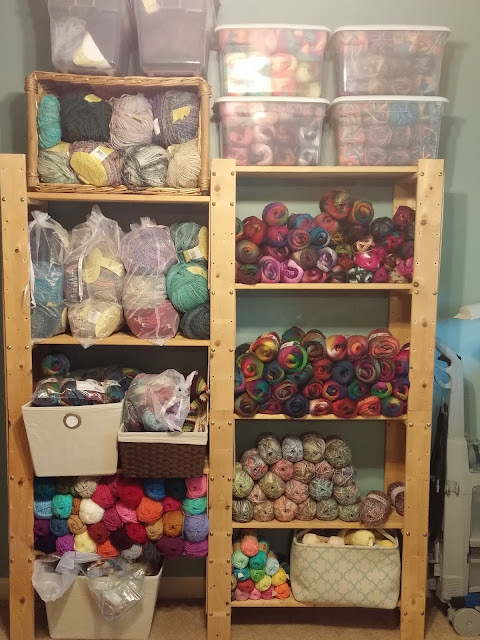 All of my Scheepjes Catona cotton yarn is in the left basket. The TV is in place for when I am paper crafting. 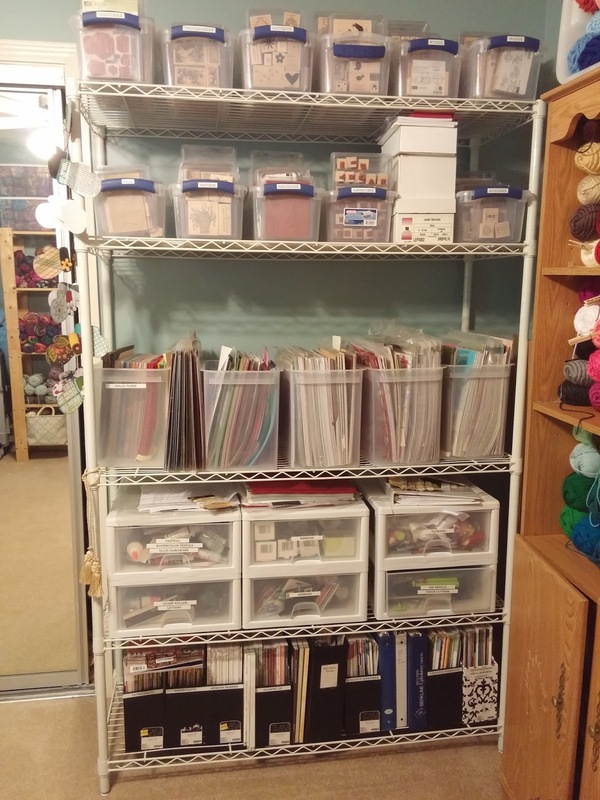 This side of the closet has papercrafting supplies on the top shelf. Cross-stitch books are in the back on the 2nd shelf with the green bag holding more cross-stitch items. That is a bit of extra I Love This Yarn next to the bag. 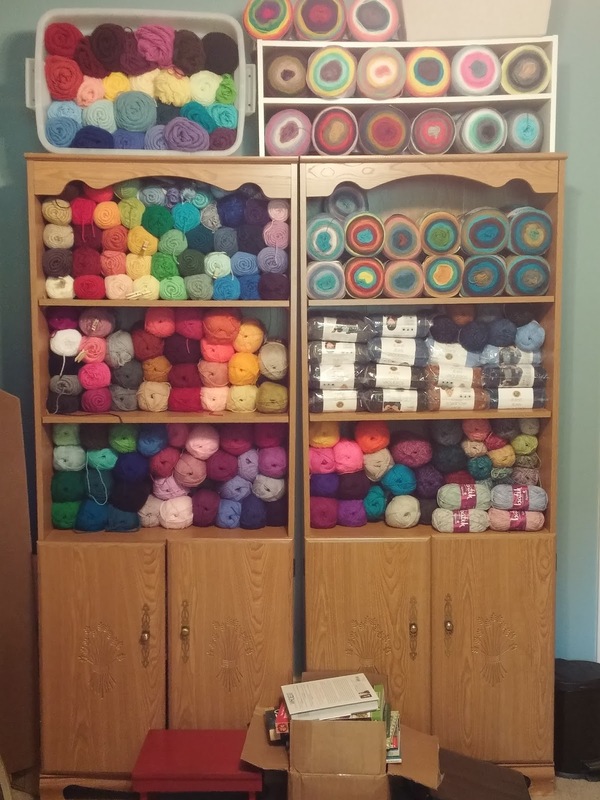 The 3rd shelf down holds my extra Caron Simply Soft. My Vera Bradley collection is on the 4th shelf. The bottom shelf holds photos and memorabilia that still needs to go into scrapbooks. 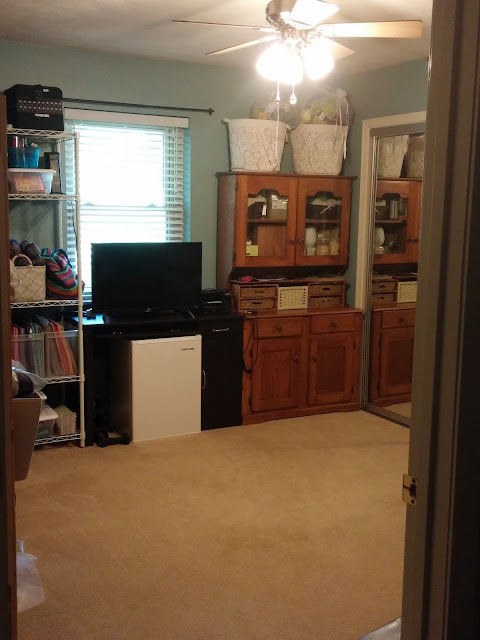 The other side of the closet has some overflow clothing from my son as we really need to re-do the organizing unit in his closet. It also contains some extra coats, scarves and gift-wrapping materials. 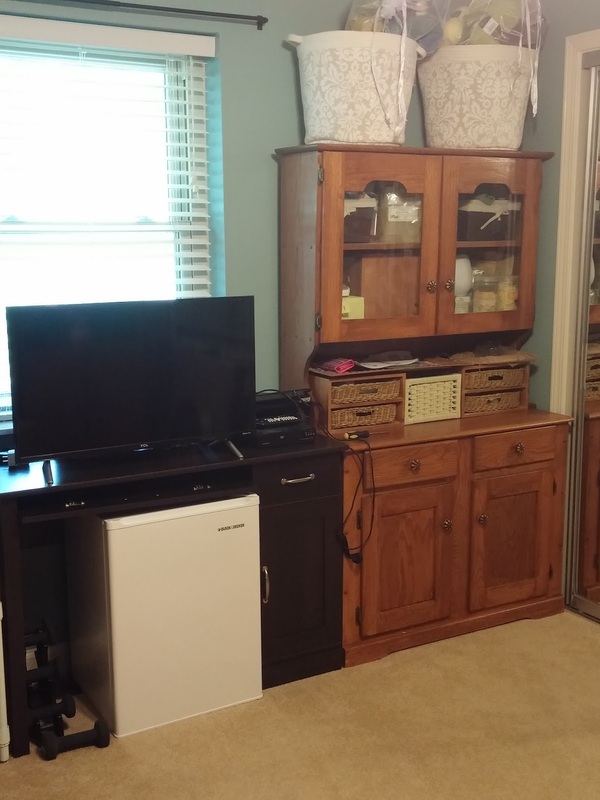 Next to the closet is this shelf which holds paper crafting supplies and magazines. Finally, we have the last set of shelves holding yarn - the top left is I Love This Yarn from Hobby Lobby. Underneath is Caron Simply Soft on top shelf. Bottom 2 shelves hold my Stylecraft Special DK. On the right side, we have 2 areas of Lion Brand Mandala yarn (the color changing circles), a shelf of Lion Brand Jeans yarn and, finally, the bottom shelf is holding some Scheepjes Colour Crafter and Stylecraft Batik and variegated yarns. (The books at the bottom need to go to a local trade-in bookstore so my husband can get a few more audiobooks). The bottom of the right shelf holds my embroidery/cross-stitch thread and a sewing machine which I have never used. I have some future projects in mind that will need a sewing machine so I will learn how to use it eventually. Well, that is the grand tour of my home. It's nothing you will see in Better Homes & Gardens magazine, but I am more about having a home that works for us and not a showplace.